Gwendolyn Brooks was the first African American to receive a Pulitzer Prize for Poetry and is best known for her poetic descriptions of African American city life. Gwendolyn Brooks was born on June 7, 1917, in Topeka, Kansas, the eldest child of Keziah (Wims) Brooks, a schoolteacher, and David Anderson Brooks, a janitor, who, because he lacked the funds to finish school, did not achieve his dream of becoming a doctor. Brooks grew up in Chicago, Illinois. Her parents often read to her and encouraged her to do well in school, but she was a shy girl. According to George Kent, she was "spurned by members of her own race because she lacked social or athletic abilities, a light skin, and good grade hair." Brooks was deeply hurt by this rejection and spent most of her childhood writing. She became known to her family and friends as "the female Paul Lawrence Dunbar" (1872– 1906; a famous African American poet). She received compliments on her poems and encouragement from James Weldon Johnson (1871–1938) and Langston Hughes (1902–1967), well-known writers with whom she began correspondence and whose readings she attended in Chicago. By the age of sixteen she had written over seventy-five poems. After graduating from Wilson Junior College in 1936, Brooks worked as director of publicity for a youth organization of the National Association for the Advancement of Colored People. She participated in poetry readings and workshops at Chicago's South Side Community Art Center, producing verse that would appear in her first published volume, A Street in Bronzeville, in 1945. In 1939 she married Henry L. Blakeley, another young writer, and together they would raise two children. Brooks continued to write poetry when the children were asleep or later while they were in school. A second collection titled Annie Allen was released in 1949. In 1950 Brooks was awarded a Pulitzer Prize for Poetry, becoming the first African American to be granted this honor. She also wrote a novel, Maud Martha, in 1953. Other poetry collections included The Bean Eaters (1960) and Selected Poems (1962). African American people. In Annie Allen and Maud Martha she examines the traditional roles of mother and father, and husband and wife, concluding that they can be damaging to those who try to live up to artificial ideals. But these messages tend to be hidden somewhat by her complicated language. In 1967 Brooks's work achieved a new tone and vision. She changed to a more simple writing style so that her themes could come across more strongly. This change can be traced to her growing political awareness, previously hinted at in Selected Poems, after witnessing the strong spirit of several young African American authors at the Second Black Writers' Conference held at Fisk University. Among such works are In the Mecca (1968), Riot (1969), Aloneness (1971), Family Pictures (1971), the autobiographical (description of her own life) Report from Part One (1972), The Tiger Who Wore White Gloves: Or, What You Are You Are (1974), Beckonings (1975), and Primer for Blacks (1980). These works are much more direct and are designed to increase the reader's level of racial awareness. No longer using traditional poetic forms, Brooks now favored free verse. She also increased the use of her vernacular (a language spoken by people of a particular group or from a certain area) to make her works more understandable for African Americans, not just for university audiences and the editors of poetry magazines. During the 1970s Brooks taught poetry at numerous institutions for higher learning, including Northeastern Illinois State College (now Northeastern Illinois University), the University of Wisconsin at Madison, and the City College of the City University of New York. She continued to write. Yet, while her concern for African Americans and hope for racial harmony was the main subject of her verse in the early 1970s, the energy and positive feeling of Riot and Family Pictures was replaced in the late 1970s with a sense of disappointment resulting from the disagreements and lack of unity among members of the civil rights and "Black Power" movements. This mood was reflected in Beckonings (1975) and To Disembark (1980), where she urged African Americans to break free from the controls of white American society and seemed to favor violence and disorder as acceptable ways of achieving that freedom. Brooks spent her time encouraging others to write by sponsoring writers' workshops in Chicago and poetry contests at prisons. In short, she took poetry to her people, continuing to test its worth by reading and speaking in taverns, lounges, and other public places as well as in academic circles. In 1985 she was named as the poetry consultant (one who gives advice) for the Library of Congress. In 1990 her works were guaranteed a permanent home when Chicago State University established the Gwendolyn Brooks Center on its campus. In later years Brooks continued to write, with Children Coming Home and Blacks both being published in 1992. She also continued to inspire others to write, focusing on young children by speaking and giving poetry readings at schools around the country. In 1997, on her eightieth birthday, Gwendolyn Brooks was honored with tributes from Chicago to Washington, D.C. Although she received many words of tribute, perhaps the best description of Brooks's life and career came from her publisher, Haki Madhubuti, when he said, "She is undoubtedly one of the top one hundred writers in the world. She has been a chronicler (record keeper) of black life, specifically black life on the South Side of Chicago. She has become almost a legend in her own time." 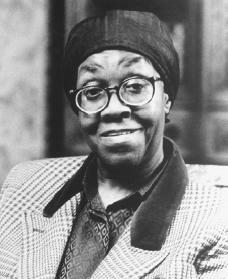 Gwendolyn Brooks died of cancer at her Chicago home on December 3, 2000. Bloom, Harold, ed. Gwendolyn Brooks. Philadelphia: Chelsea House, 2000. Kent, George E. A Life of Gwendolyn Brooks. Lexington: University Press of Kentucky, 1990. Melhem, D. H. Gwendolyn Brooks: Poetry and the Heroic Voice. Lexington: University Press of Kentucky, 1987.
she is soo inspirational to me and if yu was to ever listen or read her books,then yu wuld like her like i do.